cStreet and NationBuilder have helped to deliver one of the Australian labour union movement’s biggest wins – a long overdue pay raise for child care workers. 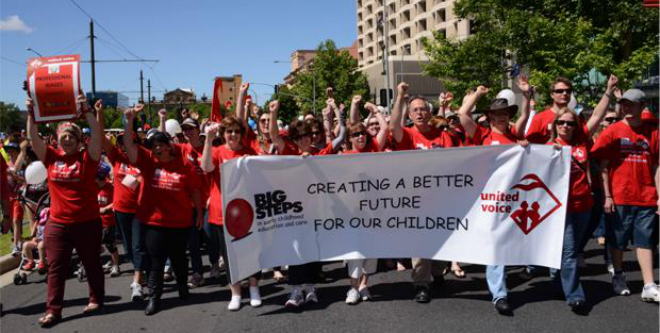 Long amongst Australia's lowest paid workers, child care educators launched a massive national campaign called "Big Steps", supported by United Voice. We fought hard for a wage increase fully funded by the federal government, so that fees for parents didn’t need to increase. United Voice is a union with a long and proud history of organising workers. The challenge we faced this time was in how to organise parents on a large enough scale to convince politicians that they needed to subsidise a wage increase, despite there being no precedent for such an action. This is where cStreet came in. They helped us to build and deploy a custom NationBuilder site for our union that allowed us to better recruit parents and supporters both in centres and online. Our ‘Big Steps’ campaign brought broad-based community support for childcare workers to bear on elected officials of all stripes. More than 12,000 did. United Voice used NationBuilder to mobilise our 12,000 supporters and 5,000 members to lobby politicians, both online and in the community, and their names were delivered on giant crayons by dozens of toddlers to the Deputy Prime Minister. The end result? An unprecedented $300 million in government funding for child care educators; enough to deliver an extra $5,000-$10,000 a year to eligible educators. We’ve just won the largest funding increase in early childhood educators’ wages in history, and best of all: we did it without raising fees for parents and families. It’s win-win-win, for parents, for employers, and for children. The commitment and passion of those who care for (and educate) our young children has made this victory possible. And with NationBuilder to help us mobilise them, politicians clearly saw the huge levels of community support and knew the time for talk was over – they had to deliver.